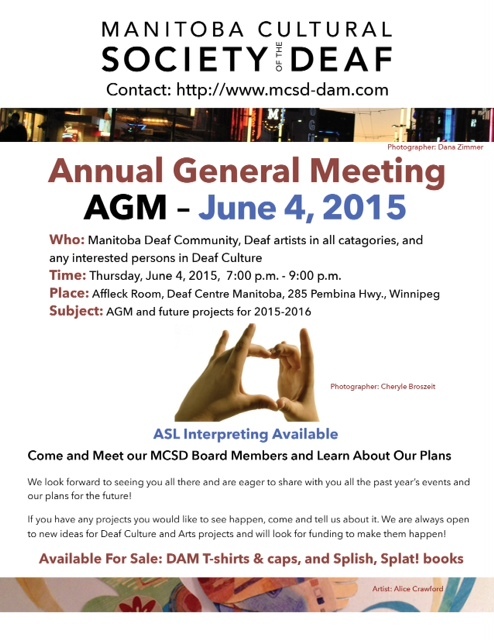 Manitoba Cultural Society of the Deaf is pleased to announce out 1st AGM since we were incorporated. It’s being held Thursday, June 4, at DCM at 285 Pembina Hwy. in the Affleck room. If you have any projects you would like to see happen, come and tell us about it. We are always open to new ideas for Deaf Culture and Arts projects and will look for funding to make them happen! Please share this with your friends and co-workers.